OK, so Christmas might be over, but they’re still a super delicious meal for the rest of this rainy winter! For the full article and recipes, pick up a copy of the winter issue of Positive Life. Link for stockists or to subscribe below. For the past two years, we have been organising a vegan, Christmas themed meal in the cosy upstairs dining room of Cornucopia, offering a set menu which includes an almost traditional plum pudding and custard so this issue’s recipe comes from what we serve there. 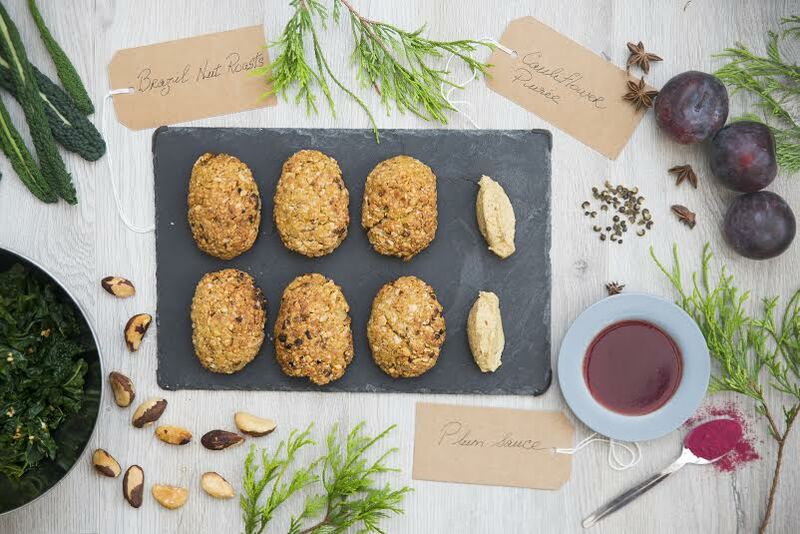 The tempeh and Brazil nut roasts are individual, protein packed patties served with a rich plum sauce, resting on a creamy roasted cauliflower puree designed to soak up the flavours. I like to have some steamed garlicy greens on the side. In the recipe for the tempeh roasts, you’ll notice that it calls for either vital wheat gluten or tapioca flour. Both work very well but offer very slightly different results. I prefer the texture of the vital wheat gluten flour, but using the tapioca flour is a perfect way to create a gluten-free alternative. 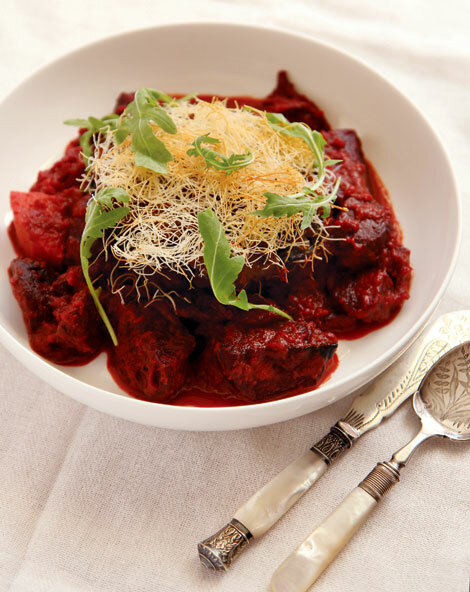 For the sauce, you will see the addition of beetroot powder at the very end but it’s added just for colour and as it can be difficult to source, don’t worry if you can’t get a hold of it, though local health food stores are your best bet! Happy cooking! Pick up a copy of the Autumn issue of Positive Life or subscribe online to have your copy delivered to your door. Beetroot, squash & green bean bourguignon with caramelised onion, brazil nut & ketaifi filled Portobello mushrooms. Heat some oil in a large heavy based saucepan and add the onion. Sweat for a minute add the wine, thyme, bay and garlic. Allow to reduce and add the carrot, beetroot, stalks, cumin and stock. Leave to simmer over a low heat for about 15 minutes. Roast the potatoes and squash in a little sunflower oil with a pinch of salt on a parchment lined tray for about 20 minutes. Slice the vacuum packed beetroot into wedges and tip into a bowl with the ground spices and a little sunflower oil, spread the beetroot over another lined tray and roast for about 25 minutes at 190 degrees. Sauté the onion in sunflower oil for about 5 minutes, add garlic and tamari. After 5 minutes add the nutritional yeast and the ground brazil nuts and seasoning. Sprinkle some oil over destalked mushrooms and top them with the nut mixture. Open the ketaifi and chop it into two inch pieces and top each mushroom with a little pastry. Bake the mushrooms in the bottom of the oven at 190 degrees for about 20 minutes. Serve the bourguignon in a shallow bowl topped with a mushroom. 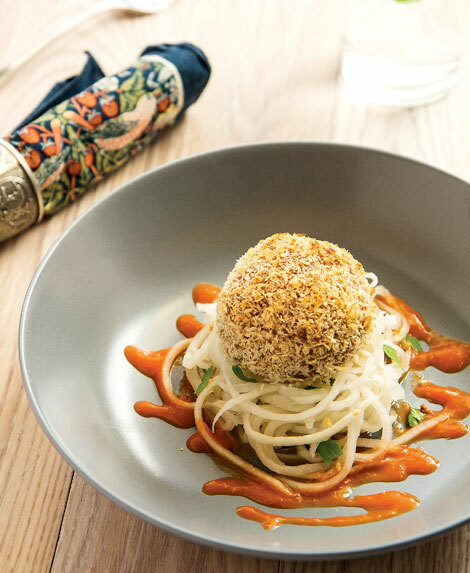 Panko crusted coconut arnacini with spiced tofu, daikon noodles and chilli-plum jam. Method: Puree the ginger, lemongrass, garlic and chilli in a food processor; add a little water to make a paste. Heat a little sunflower oil in a heavy bottomed saucepan. Add the onion and spices. sautee for a minute, add the Arborio rice. Stir rapidly to coat the rice. Add the mirin and lime and leave to absorb. Whisk the coconut and hot water until combined. Add this to the rice ladle by ladle until it is all absorbed. season. Leave to cool before use. Tofu: Combine all ingredients, spread out and bake on a parchment lined tray at 200 degrees for about 15 minutes. Jam: Simmer all ingredients for about 30 minutes, puree and pass through a sieve. Noodles: Peel the daikon and shred into noodles with a julienne peeler or for a flatter noodle, use a regular peeler. Combine with the other ingredients. Arnacini: From your left to right you will need firstly the rice then the tofu, a bowl with the batter, followed by a plate with breadcrumbs and lastly a parchment lined oven dish to bake them on. Take a ball of rice slightly larger than a golf ball and flatten it out. Take a small amount of tofu, press it into the centre and fold the rice around to encase it. Roll the ball in the batter and then in the panko breadcrumbs and place it onto the lined tray. Repeat with the remaining mixture. Bake them in a preheated oven at 190 degrees for about 20-25 minutes, Serve immediately with the noodles and the jam.